I love ice cream. It’s true. I can pretty much each ice cream anytime, anywhere. For me, as it gets colder, ice cream seems taste better for me. I know, it makes zero sense. I always get excited about trying new to me products especially Klondike, because single serving ice cream options are always a little better for the waistline, right? Have you heard of Klondike Kandy Bars? They are just as yummy as the original Klondike Bar but with yummy candy middles. We picked up the Cookies & Cream and Triple Chocolate Krunch and they were the perfect snack after we carved pumpkins this past week. I also picked up a few extra packages to have on hand when we have friends and family over for football or just visiting. It’s easier to pull out a box of ice cream rather than scooping – and no mess, which is always a win in my book. As I mentioned we tried the Cookies & Cream. For me it tasted like the cream part was just the crunch outside coating with chocolately goodness inside. Really yummy. Husband loved the Triple Chocolate Crunch. Why is something crunchy with ice cream so good? 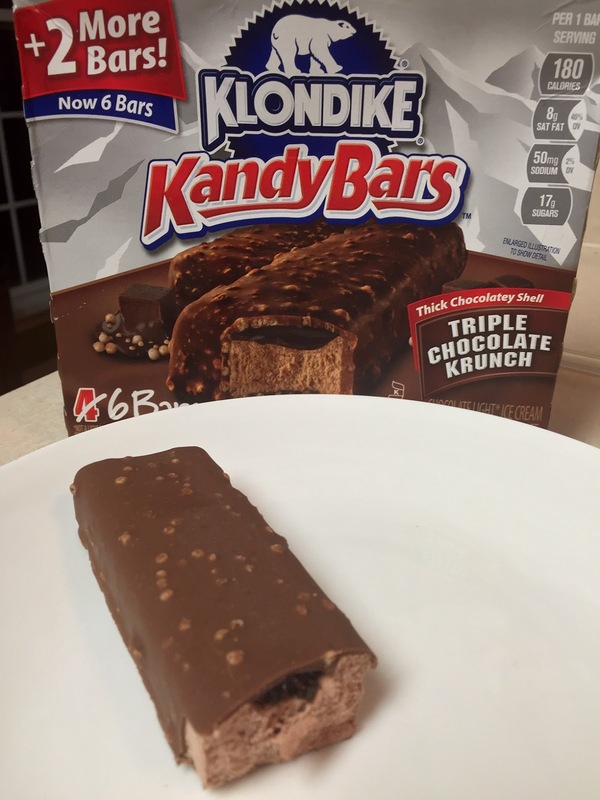 Bonus – Klondike upped their packages from 4 to 6! More ice cream? Yes, please! They also carry Caramel & Peanuts and Mint Fudge Cookie Kandy Bars. We may just have to try all four options! You also can’t neglect the original Klondike, they have 12 different varieties including my new favorite Cookie Dough Swirl. There is still something so satisfying and good memories as biting into a classic Klondike. I really loved the caramel pretzel. That combo of salty and sweet hits the spot every time. Want to learn more about Klondike and their products? Follow them on Facebook, Twitter or Website. So many choices, it’s hard to pick just one. What is your favorite Klondike Bar flavor? This is dangerous. I shouldnt have seen this.